This property is directly associated with the early twentieth century developmental era (1920-1930) when a significant number of commercial buildings were constructed and the modern downtown commercial district was fully established. In 1923 Seattle adopted its first ordinance that regulated specific geographic areas for specified uses; it allowed the most densely concentrated commercial development to occur in the downtown core. 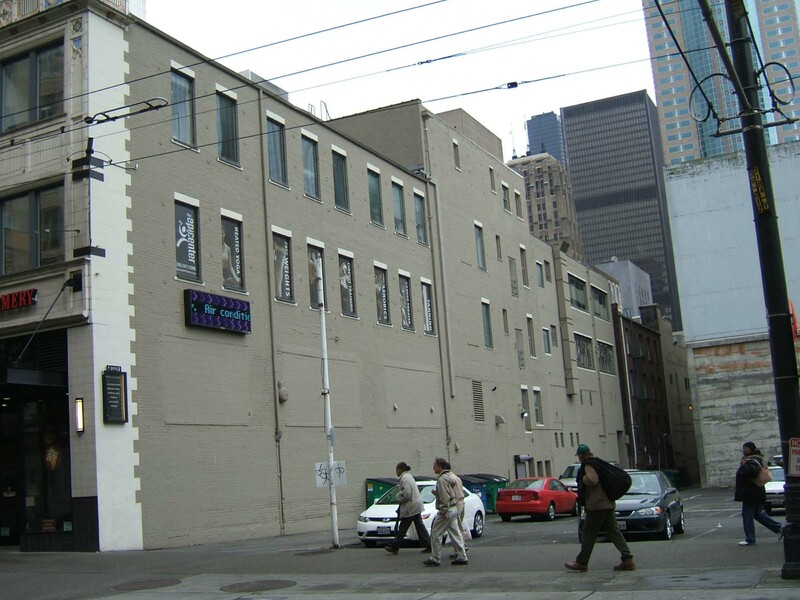 The economic prosperity of the 1920s stimulated the development of numerous major highrise commercial buildings, as well as smaller-scale bank and commercial buildings, major hotels and apartment hotels, club buildings and entertainment facilities, which were typically designed by leading Seattle architects. During this era, the original residential district was entirely absorbed by commercial and other real estate development. By 1930, virtually all of the old residential properties - as well as many of the immediate post-fire era commercial buildings outside of Pioneer Square - had been demolished or removed. The Seattle Kress Store was built in 1923 and designed by New York architect E.J. Hoffman, who may have been responsible for a number of other Kress Store buildings elsewhere in the nation. By 1923, the retail core was becoming less concentrated along Second Avenue, as the Frederick and Nelson Department Store had relocated to Fifth Avenue and Pine Street. The Kress Store was part of a nationwide chain of “five-and-dime stores” begun in 1896 by Samuel H. Kress. He created the S.H. Kress & Company with the intent to provide quality merchandise at the lowest possible price and his commercial enterprise grew to became one of the most successful retail operations of the twentieth century. The company took pride in well designed and constructed store buildings and operated an architectural division within the company from 1905 until 1944. Kress architects were responsible for designing the exteriors and interiors of over 220 store buildings built on small town main streets and neighborhood commercial locations. By the late 1920s the company employed over 100 people working on store designs. These stores were constructed using high quality materials and a wide range of façade designs to fit the scale and context of specific streetscape. What did remain constant for the Kress Store image was the lavish use of terra cotta and prominent “KRESS” letters or logo, a perpetually distinctive element displayed high upon the building, its doors and windows. Edward F. Sibbert, the company’s chief architect designed a distinct group of streamline and Art Deco modern store facades between 1929 and 1944. Al of the Kress stores utilized a systematic floor plan to efficiently display goods and direct customer circulations. Store included retiring rooms and soda fountains (typically in the basement level) to encourage shoppers to linger. After WWII, the company began to extend its retail operation to suburban locations. Following a national trend, the Seattle Kress Store vacated its downtown location as more lucrative markets were established in suburban shopping malls in the 1960s. The Kress Company evolved into what is now the K-Mart group of shopping mall retail outlets. This is a partially intact example of a particularly rare and important downtown property type - national chain store - from this era and it exhibits distinctive polychromatic terra cotta ornament. . Located at the SE corner of Third Avenue and Pike Street, this three-story commercial block was designed and built to house a national “five & dime” chain store. The ground floor currently houses a variety of retail stores and the upper floor level appears to be used for commercial office purposes. It measures 111’ x 116’ with five bays oriented toward both Third Avenue and Pike Street. It exhibits a two-part commercial block façade with particularly distinctive polychromatic Gothic Revival derived terra cotta ornament. The reinforced concrete structural system (with a concrete basement/ foundation) is entirely clad at the upper floor levels with glazed cream color terra cotta panels and polychromatic (blue/green/rose) terra cotta ornament. The base has been extensively altered including the removal of the original signage band, transom and display windows, and original shop entrances and canopies. The upper floor levels on the two major facades remain intact. Both facades are divided into five distinct structural bays; at Third Avenue each bay includes five windows and at Pike Street the end bays include five windows while the central bays include four windows. All of the spandrels between the second and third floor levels include terra cotta ribbed panels with a central polychromatic (blue/green/rose) medallion using a gothic tracery motif. The structural piers are clad with terra cotta panels with the uppermost panels decorated with polychromatic tracery and quatrefoils set in a blue background. A band of moulding below the parapet exhibits a series of rose-colored medallions. The parapet is partially crenellated as it is stepped toward the central bay at each façade. It is highly decorated with terra cotta panels and pier caps adorned with polychromatic tracery and quatrefoils motifs. At the raised central bay of each parapet the terra cotta cast “KRESS” emblem remains in place. In addition to the noted base/storefront level alterations, all of the original 1/1 double-hung wooden windows at the upper floor levels have been replaced with modern fixed sash members. There do not appear to be any intact or architecturally significant interior building features, finishes or public spaces.